Coffee Pot Stamping Cafe: I Love Christmas! Although I have most of my decorating done for Christmas, I keep adding little touches as the days go by. I'll get this idea and just have to arrange things to see if it's going to look good. This is one of the areas I've played with and have finally decided it may just be the way I want it. 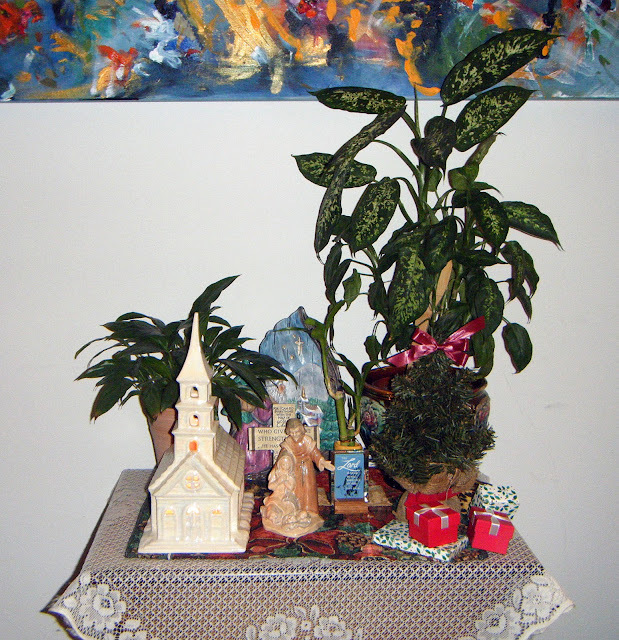 It has three of the ceramic pieces that my mother made and gave to me as gifts. The church is my night light and it looks so beautiful at night. The Jesus, Mary and Joseph figurine is done in neutral tones so I can put it with any color and it looks good. The piece in the background is a vintage Santa delivering presents to a sleeping village. Looks like I need to take a stand-a-lone shot of that one so you can appreciate it the detail. Yes, the plants are real. On the left you have Lily, my peace lily. Lucky is the little bamboo plant that I recently added to my plant family. He is named such because some believe bamboo is lucky. Me, I believe it is just an interesting plant that needs little care other than plenty of water. And, on the right, is Treebeard. He is named for the eldest of the Ents from the movie, Lord of the Rings. He has grown about a foot in the last few months. I have no idea what prompted the growth spurt but I love how he looks. The little tree in front of him, I'm sorry to say, is fake. As much as I love the Norfolk Pine, I have a tendency to cause their demise so I can't bring myself to get another one. Now it's time I got back to finishing up some Christmas gifts. Thanks for stopping by today.